Review In A Nutshell: This was a really fun, quick fantasy read perfect for fans of A Court of Thorns and Roses and fae stories. This book was an entertaining read, but I wouldn’t say it was perfect. I’ve seen a lot of hype for this book, and a lot of it deserved, but it does have some faults. I felt that it was a bit rushed in some areas, and there needed to be a bit more exposition in order for the stakes to be fully understood. I felt there wasn’t much explanation for a lot of things, and instead, we were just told we should be worried about this one thing we know nothing about. In terms of plot and characters, this book was really fun. I liked Isobel and Rook as our main characters. Isobel was smart, talented, but also flawed. At first, I felt her and Rook’s relationship was a bit insta-love-ish, mostly because although weeks passed for them, it was only a few pages for us. Luckily later in the book, the insta-love-ness (wooh lots of hyphens) of their relationship was pointed out and redeemed. Rook as a character was one of my favorite parts of this book. It was very funny to see him interact with Isobel considering he has no idea how humans work. While the plot itself wasn’t completely original or mind-blowing, a talented girl is forced into the fae world by a beautiful fae prince, there were definitely original aspects that I enjoyed. Isabel was 100% done with Rook after he kidnapped her, and it was great to witness their interactions. I also loved the setting and lore. For such a short, stand-alone novel, Rogerson really thought out the everything in this world. For example, there was the idea of Craft (painting, cooking, sewing, etc) being something only humans can do, and that’s why the fae keep humans around and interact with them. Many books with fae say either the fae keep humans for entertainment, but it’s nice to see a reason why the fae can’t be the ones providing said entertainment. I also loved the take on what it means to be fae and be immortal vs human and mortal. I feel in many fae novels, many problems would be fixed if the human could only become fae, but here you can see why that’s not a great solution, and why our protagonist would rather die. What hurt this book the most, in my opinion, was the short length (under 400 pages). Most of the issues I felt were with a lack of exposition and twists in the plot, which could have been fixed by just a few more chapters. You can tell the author, Margaret Rogerson, had many places she wanted this book to go, that are only barely touched on. For example, there are dark tones in this book, but you don’t truly comprehend and feel that while reading. Also, the climax of the book was a little too fast-paced, and due to the quickness of it, it was harder to feel invested and be absorbed by it. If these parts were just a little bit longer, I feel like it could have been astounding. From what I was just saying, you may be wondering why I gave it 4.5 stars if I had those many problems with it. Trust me when I say the stars are deserved. 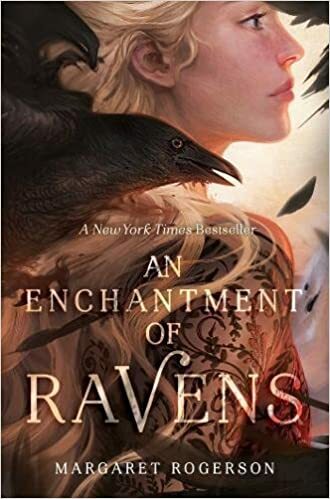 Despite its faults, the writing style was amazing, and by far the best aspect of An Enchantment of Ravens was the world building. Rogerson built a beautiful and complex fantasy world in under 400 pages, something many authors can’t quite grasp. Also, this book was surprisingly funny at points (I caught myself laughing out loud quite a bit, which isn’t common for me) and the plot itself was really fun. PLUS it’s a stand-alone, which makes it so much better because this entire fantasy world is built and explored in only one book, something that is rarely done as well as it’s done with this book. Cons– Not the most original plot, and lacked some exposition on certain topics which left me a bit frustrated.